In my MS clinic, I have to continually work on a narrative to explain to pwMS why they are getting worse despite having no evidence of disease activity. The following is a draft of a paper I am working on. Does it make sense? Is it too complicated? Does it need pictures? Thanks. 1. SS (scissors and stripper): The acute focal inflammatory lesion acts like molecular scissors and strippers, cutting axons and stripping myelin off axons. The cut and naked axons are blocked from conducting signals and result in a neurological deficit. The neurological deficit from this acute conduction block will vary depending on the pathway affected, for example, if the lesions affect the optic nerves it will cause loss of vision. The way to prevent the SS from causing conduction block is to prevent new lesions from forming. 2. EF (energy failure): The demyelinated axons may recover function by a process called axonal plasticity or remyelination. Axonal plasticity is the process by which the neuron inserts new ion channels into the demyelinated axonal segments and restores conduction. Remyelination may also occur, but the new myelin is never as thick and as efficient as the old myelin and is susceptible to intermittent failure. These demyelinated and thinly remyelinated sections of axons are susceptible to temperature and fatigue. If the temperature rises these sections block and if the axons are used too much, for example with exercise, they run out of energy and also block. Sometimes the type of ion channel that is inserted into the axons fire spontaneously can cause intermittent symptoms, for example, pins and needles, pain, neuralgia and muscle spasms. As these ion channels are sodium channels it explains why these intermittent symptoms respond to drugs that block sodium channels, for example, carbamazepine, oxcarbazepine, phenytoin and lamotrigine. Another process that helps with recovery is that the surviving axons form sprouts to reconnect disconnected pathways and create new synapses, which are the connections between nerve fibres. All these processes increase the energy requirements of the axon, which makes it vulnerable to die-off later. At the same time the ‘MS lesion’ remains inflamed and some of the chemicals produced as part of the inflammation poison the mitochondria, which are energy factories of the axons. A further reduction in energy production puts further stress on the system. As a result of these processes, there is a delayed dying off of axons that takes place over months to years after the initial MS lesion has formed. This delayed dying off of axons explains why despite effective treatments stopping new MS lesions from forming some people with MS still notice a slow deterioration in their functioning. 3. SB (slow burn): Some MS lesions never recover and become slowly expanding lesions or SELs. SELs have a rim of hot microglia at their edges and continue to swallow up the myelin and axons of the surrounding ‘normal-appearing’ tissue. These lesions don’t have much acute inflammation left in them, i.e. there are very little T and B cells in these lesions. SELs continue to expand over years to decades and are responsible for the slow accumulation of damage over many years. SELs can be seen on MRI; they typically cause black holes on so-called T1-weighted MR images and have a dark rim of iron around them when viewed with special MR sequences (susceptibility imaging). The iron rim is a marker of these so-called ‘hot microglia’. 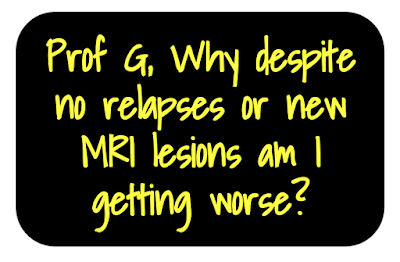 At present we have no idea what causes some MS lesions to regress and recover and for others to expand and become SELs. What we do know is that our standard anti-inflammatory DMTs have very little or no effect on SELs once they have developed. It is important to realise that SELs are found throughout the course of MS and are even seen in people with a radiologically isolated syndrome (RIS) or asymptomatic MS. In other words, the so-called ‘progressive MS pathology’ is found very early in the MS disease course. We do know that the number and size of the SELs increase with disease duration, i.e. the more MS lesions that develop the more SELs will be formed. Another important observation that has recently emerged is that a single strategically located SEL can cause an extraordinary amount of damage; for example, a single SEL in the so-called pyramidal tract or motor pathway can cause progressive weakness down one side of the body. I have a few patients like this and it is very disheartening when their weakness fails to respond to standard anti-inflammatory therapies. An interesting debate is whether or not the ‘hot microglial’ response is abnormal, i.e. pathological, or is occurring in response to something in the surrounding tissue. I support the latter view and hypothesise that there is something in the surrounding tissue that is activating the microglia and they are just doing their job and trying to clear-up the inciting agent. Others have suggested these microglia are responding to the back-end, or Fc-end, of antibodies and activated complement components as a result of these antibodies reacting with their target or in a non-specific manner. Other hypotheses include viruses, e.g. EBV and HERVs, are driving the expansion of these lesions. The way to test these two competing hypotheses is to use drugs that switch off or suppress microglia. If the ‘hot microglia’ are the problem these drugs will work and stop SELs getting bigger. If the microglia are just doing their ‘job’ these agents are unlikely to work. It is also important to remind you that myelin debris inhibits remyelination so these microglia may be needed to help with the repair. The problem is that without being able to switch off the abnormal processes that are causing SELs to enlarge trying to stimulate repair mechanisms may be futile. Another factor that can’t be ignored is recurrent infections, which sometimes affects a lot of people with advanced MS. Recurrent urinary tract infections (UTIs) are the biggest problem. This is why we take UTIs so seriously. Every time you get an infection it causes your immune system to produce cytokines, or inflammatory messengers, that travel to the brain and boosts the activity of the microglia. The hot microglia then exacerbate the damage that MS is doing to your brain and spinal cord. This is why many of you tolerate infections so poorly and often don’t recover back to baseline after a severe infection. There is a lot we can do to reduce recurrent bladder infections. For example, the judicious use of intermittent self-catheterisation, drinking lots of liquids to flush the bladder, using urinary antiseptics to suppress the growth of bacteria in the bladder and screening for asymptomatic UTIs using self-monitoring home dipsticking and prompt treatment. The upshot of ‘slow burn’ is that we need additional therapies to add on top of DMTs that stop new lesions, and in particular chronic expanding or SELs, from forming. These treatments may be drugs to purge the CNS of antibody-producing B cells and plasma cells, drugs that inhibit complement activation and/or the activation of Fc receptors on microglia, anti-virals that target EBV and HERVs, and/or drugs that inhibit activated microglia. In other words, there are many therapeutic targets that still need to be explored as add-on therapies in MS.
4. PA (premature ageing): Most of you are aware of the effects of ageing on the nervous system. The brain and spinal cord were never designed by evolution to last longer than about 35 years. It is only relatively recently that as a species we have extended our lifespans. Once you go beyond approximately 35 years of age there is a gradual loss of nerve cells and axons. This explains why as you get older you notice the effects of ageing; reduced vision, loss of hearing, poor balance and sadly age-related cognitive impairment. In short, life is an age-dependent neurodegenerative disease. If we all live long enough we will all develop cognitive impairment. What protects us from age-related changes is so-called brain reserve capacity, i.e. the size of the brain and spinal cord, and cognitive reserve, which relates to education level and environmental enrichment (social capital, adult learning, cognitive exercises, etc.). We know that MS reduces both brain and cognitive reserve and as a result people with MS experience the impact of ageing much earlier. I refer to this as premature ageing. Can we do anything about this? Yes, we can. We know from studies in the general population there are many things that you can do to maximise your brain and cognitive reserve. This is called Brain Health and involves lifestyle factors such as exercise, diet, sleep and avoiding smoking and excessive alcohol consumption. It is also important to be screened for comorbidities or other diseases and have them treated; these include smoking, hypertension, diabetes, obesity and abnormal lipids. As for diet, there have not been any that have been studied specifically in MS. However, data from animal and other studies indicate that calorie restricted, intermittent fasting and ketogenic diets have the most promise with regard to brain health. However, we need more evidence of their beneficial effects before promoting these to pwMS. Ageing is also a biological process and as we decode the molecular programmes that cause ageing we may be able to develop treatments that reverse ageing. An example of this is metformin, a drug for treating diabetes has recently been shown to reprogramme oligodendrocyte precursors in older animals to behave as if they were young cells and become more efficient at remyelinating axons. I envisage in the future using anti-ageing drugs as add-on therapies to treat MS. Many of you will be tired of hearing me speak about Brain Health, but if we want to maximise the outcome for pwMS we need to treat MS holistically and that means living a Brain Healthy life and for us to offer you a brain health and wellness programme. The big challenge is getting the NHS to fund this initiative. When I suggested to my previous manager that I wanted to start an MS Wellness clinic he laughed; C’est la vie! Love this blog! It's bookmarked on my phone. My wife has MS and this is a great resource to stay up-to-date. One small tweak to the blog format that I'd recommend is to move the author name and date to the top of the article, more in line with a newspaper byline. I'm looking forward to the redesign. Thank you for taking time out of a busy schedule to do some community engagement! It does what is says on the tin; it gives you the name of the person writing it, the date and an estimate of how long it will take to read. Please note we are moving off the blogger platform, which we find is too limiting. Thank you for this Dr. G. This is the best post you have done on progressive MS and is easy to understand. It also highlights the absolute lack of treatment currently in progressive MS. Sadly, current neuroinflammatory DMDs fail to address 3/4 of your headings unless MS is caught very early prior to the formation of any of these devastating lesions. What do you give progressive patients as a treatment plan today? Re: "What do you give progressive patients as a treatment plan today?" They still need an anti-inflammatory, which is why we are doing ORATORIO-HAND and CHARIOT-MS studies. I also advise all the lifestyle issues and target comorbidities. In terms of tackling the MS pathology we are doing add-on studies, i.e. add-on oxcarbazepine (PROXIMUS trial), high-dose biotin (SPY-2 study), opicinumab (AFFINITY study), etc. Pictures always help as people learn differently. Do you actually try model your treatment plan after your treatment pyramid with drugs that are currently off-label but approved? Is there anything at all that might stop the Slow Burn RIGHT AWAY? Same with Energy Failure – anything that could reduce the rate? Re: "Between Slow Burn and Energy Failure, which is the bigger factor? (Probably)"
They are not independent of each other, i.e. the inflammatory mediators produced as part of slow burn also cause energy failure. I would say that overall the slow burn is the most important issue that needs addressing, i.e. it is core the pathogenesis of advanced MS.
Re: "Is there anything at all that might stop the Slow Burn RIGHT AWAY?" Unfortunately, nothing at the moment is except to prevent it. This is why you need to be on effective treatments to stop new lesions from forming. An important questions is whether or not oligoclonal antibodies that are produced in the brain are the primary driver of the slow burn. If they are you need to clear these from the brain and spinal cord. This is something we are actively working on. Re: "Same with Energy Failure – anything that could reduce the rate?" Again nothing that I could recommend with confidence. High-dose biotin is thought to help sick mitochondria work better, but we need to see the results of the phase 3 trial before recommending this to MSers. What is the difference between a urinary antiseptic and an antibiotic. I have real problems with UTIs. Re: "What is the difference between a urinary antiseptic and an antibiotic." Not much. A urinary antiseptic relies on the kidney excreting the active drug and concentrating it to a level that is effective in suppressing bacterial growth. The dose and systemic (whole body) drug exposure is meant to be too low to impact on the bacteria elsewhere. Therefore there impact on the gut microflora for example is meant to be less. ProfG mentions age as a problem for brain health. The high occurance of MS is in part describes by a longer life span. This is an excellent, concise paper. In answer to your questions, I find it makes clear sense and, depending on the intended audience, is neither complicated or in need of illustrations. Given my personal interest, I applaud your holistic Brain Healthy lifestyle and anxiously await the results of the PROXIMUS trial, the ORATORIO-HAND, CHARIOT-MS, high-dose biotin (SPY-2), opicinumab (AFFINITY) studies. Your initial question about the paper you're working on doesn't make clear whether this is specifically designed to share with patients posing the question of deterioration despite NEDA. If it is then, I think that it will be very beneficial in providing them with a detailed explanation of the reasons why. I do anticipate that those who are less knowledgeable may struggle with some of what is provided. For example: axons and microglia – when I first started getting a handle on MS I had no idea what these sorts of things are. Perhaps directions to where descriptions can be found could be incorporated. Also, it's possible that use of analogy will allow the information to be even more accessible: I recently found one of MD posts from 2012 when he used the idea of imagining WBC as cars moving along roads (blood vessels) to the car park (brain) where the barrier was stuck in the up position (blood, brain barrier) allowing the cars into the car park. The post went on in that vein and personally I found it more accessible. Equally I've found it easier to recall. Do you have any advice regarding ‘self-monitoring home dipsticking’? It can take a few weeks of trying to get a GP appointment. I have asked if I can drop off a sample for a nurse or doctor to test and I have asked if I can have a stick to keep at home but it was a ‘no’ on both accounts. Hi, I suffer from recurrent UTIs and have had retention problems as part of my latest relapse. Nurse at GP surgery suggested I buy a tub of dipsticks on Amazon, which I did, as well a few sample pots, so I could test at home – obviosuly I don’t want an undetected UTI to be exacerbating other symptoms. I’ve told the GP and my neurologist I’m home dipsticking and they both seem quite happy with this approach and to trust me to self-report! Don’t know whether all GPs and neuros would agree but it’s quicker than an appointment, gives me extra peace of mind and the kit is cheap enough. Thank you Sarah, good idea. MS seit 2002, seit 2009 SPMS. Stabiler Verlauf seit 2014, Gehstrecke 130 Meter, EDSS 5.5 stabil seit 2014. Remyelinisierung, 2 Verlaufskontrollen pro Jahr mit MRT am Universitätsspitsl Basel, Switzerland. Man kann SPMS stabilisieren, Oligodendrozyten zum Wachsen bringen, Entzündungen eindämmen. MS since 2002, since 2009 SPMS. Stable course since 2014, walking distance 130 meters, EDSS 5.5 stable since 2014. Remyelination, 2 follow-up visits per year with MRI at the University Spitsl Basel, Switzerland. It is possible to stabilize SPMS, to grow oligodendrocytes, to reduce inflammation. I agree. A small proportion of people with MS, even advanced MS, stabilise. Prof W. Ian McDonald referred to this as burnt-out MS. If only we knew what was different about people like you and make it our treatment target. ich weiss es. Mit Avonex wurde meine MS zu einer SPMS mit aufgesetzen Schüben, 2 hyperintense Lässionen pro halbes Jahr im MRT sichtbar. Mit Betaferon wurde die aktive SPMS zu einer SPMS ohne aufgesetzte Schübe, aber blieb progredient. Zusätzlich mache ich zu Betaferon die ****** MS Diät, nehme 5000I.E. Vitamin D3, 2 Mal 500mg Kurkuma, 2Mal 400mg Nervonsäure, 2Mal 300mg Alpha Liponsäure, 2Mal 200mg Uridinmonophosphat, B Vitamine, Keltican Forte, Magnesium, Kalcium, Q10,2 Mal 100mg Cholin, täglich, so ist die SPMS stabil und Oligodendrozyten und Axone wachsen. your blog is very helpful for me, thank you very much! Thank you. It is good to know. Very, interesting read thanks for the insight. With regards to diet, I’m not sure of anyone has read overcoming ms written by Australian dietian and professor.